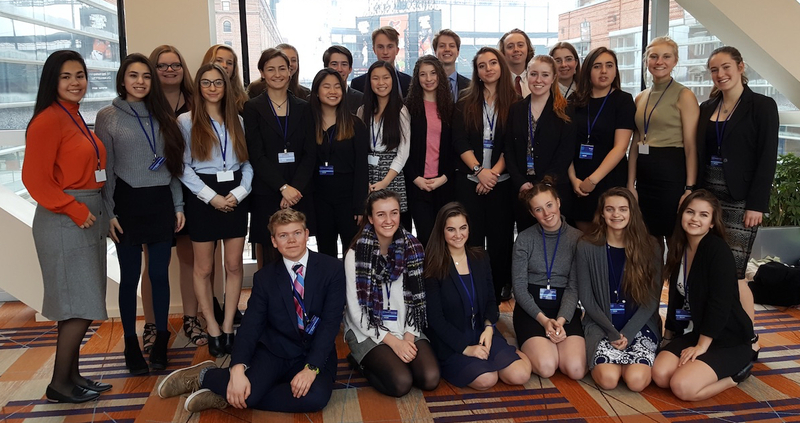 From February 7 – 11, 2018, Jackson Hole students attended the 21st annual Johns Hopkins Model United Nations Conference in Baltimore, MD. Over 1,800 students from across the country and around the world participated in the conference. Thirty students from Jackson Hole High School, Jackson Hole Community School, and Journeys School competed as one delegation led by InterConnections 21. 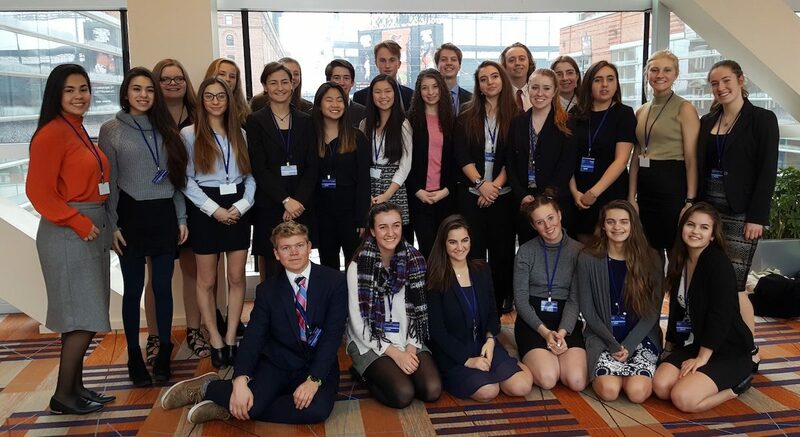 In the context of our mission to promote student learning and action about critical global issues, InterConnections 21 has made participation in national Model United Nations (MUN) conferences one of our signature programs. Ongoing mentoring of high school students, who are motivated and passionate about global issues and keen to develop their leadership skills, is a high priority for IC 21. MUN conferences simulate various bodies and agencies of the United Nations. MUN involves dynamic debate, public speaking, research, teamwork, leadership, and critical thinking about important global issues. Students spent four days in committee sessions debating their assigned countries’ positions on multiple topics and devising practical solutions to real-world problems. Our committee assignments this year included the UN High Commissioner for Refugees, UN Development Program, Special Committee on Environment and Natural Disasters, UN Commission on the Status of Women, and many others. During a quick break in the action, students were able to tour the Johns Hopkins campus, check out Baltimore’s Inner Harbor, and explore the National Aquarium. Our students proudly represented Jackson Hole, and news of the delegation from remote Wyoming spread throughout the conference. Special congratulations go out to three award winners: Grace Prochilo, Honorable Mention (Kenya, Futuristic World Health Organization); Rosalie Daval, Outstanding Delegate (Kaiser Wilhelm of Germany, Special Ad-Hoc Committee of the Secretary General); and Aaron Trauner, Best Delegate (Crown Prince William of Albania, Special Ad-Hoc Committee of the Secretary General). Earning these awards is impressive enough at such a large conference but is even more remarkable considering that one award winner was in committee with over one hundred other students and two of the winners debated in an invitation-only committee based on a special application process! Congratulations to all of the students on a fantastic trip!